We have all been there – you have found a great pole saw that can cut through everything, but you are so sick of being restricted to the reach of the cord, or getting tangled up in miles of extension cords. Now you can leave all of that hassle behind forever – invest in a cordless pole saw today! Cordless pole saws are not powered by gas or by cords, they are powered by batteries – but you will lose basically all of the most convenient aspects of batter power if your saw burns through batteries at a rapid rate. Save yourself the hassle of constantly needing to switch out batteries and find a saw with good battery life. One of the best aspects of a cordless pole saw is that it is not hampered by heavy gasoline motors or awkward cords. This quality means that these models can be maneuvered to reach more tricky angles than other types of pole saws. But none of that is useful unless the saw has sufficient reach to even get to those angles! Going off of what we mentioned about reach, you do not want a saw that is going to weigh you down so much you will not even be able to fully extend it to the desired reach. Go with a lighter model and make things easier on yourself. 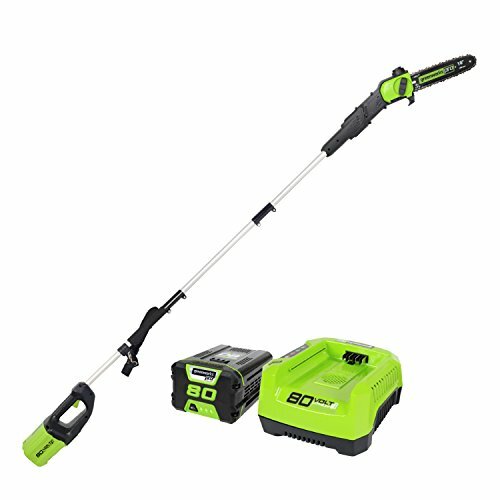 The Greenworks 8.5’ is a great pole saw that will be applicable in pretty much any circumstance. 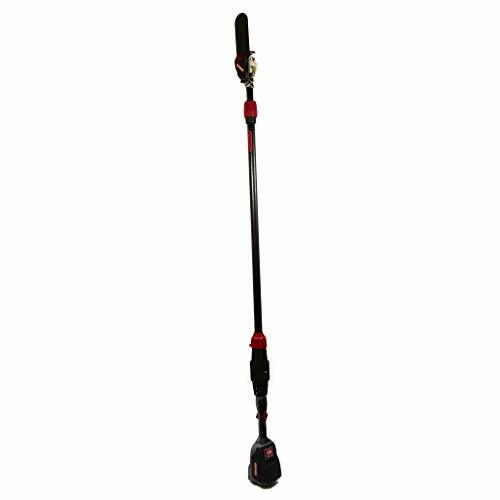 It is also super accessible, even for those without any sort of pole saw experience – it does not require any tools for its initial setup, a setup that is quick and easy and will not take very much time at all. There is not much about using this saw that is not also quick and easy: checking and refilling the oil levels is a simple process, as is cleaning and wiping the saw down after use, and of course, using the saw itself. Just because it is easy to use, however, does mean this saw can’t hold its own with the best of them. This saw can reach whatever tree limb you are aiming for, even if it is fifteen feet above your head! It balances this incredible reach with its light weight well, so that you will never feel out of control or unsafe when using this saw. There is not much to dislike about the Greenworks 8.5’. 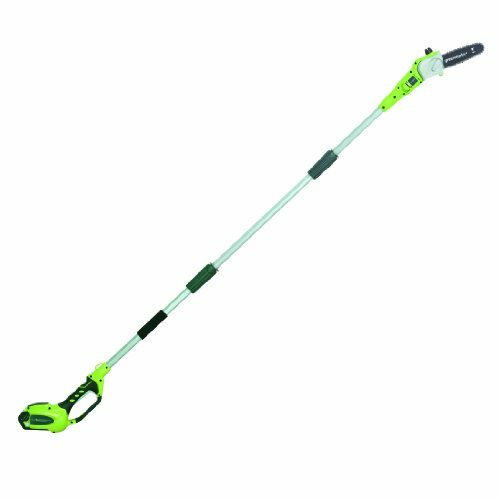 The Greenworks 8.5’ is a fantastic pole saw that is simple and easy to use – with one exception: the battery release mechanism is not exactly the most straightforward. The BLACK + DECKER LPP120 is a lovely saw if you are looking for a top of the line option that will give you a huge amount of bang for your buck. This saw comes with pretty much anything you would ever imagine needing when hacking through tree limbs: an Allen wrench for chain adjustment, an oil bottle to keep the chain lubricated, a battery pack and battery charger so you can keep the saw going, a storage bag for all of the above, AND an additional scabbard to cover the saw during storage and transportation (plus, the scabbard also has a strap for the oil bottle and a slot for the Allen wrench – BLACK + DECKER really did think of everything when they designed this saw). And do not think that this saw can’t hang when it comes to chewing through tree branches – it can definite chomp through a wide variety of branches with ease. If you are looking for a great little model that you do not anticipate putting to super heavy use, the BLACK + DECKER LPP120 is a dream come true for you. The BLACK + DECKER LPP120 is an awesome saw that will never let you down. Just keep an eye on the wobbliness factor when you have it way up in the trees. 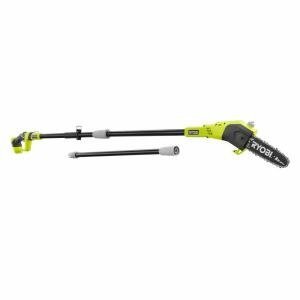 The Ryobi One+ Cordless Electric Pole Saw is Can cut through limbs up to six inches in diameter is a great option that will get the job done for you with ease and withstand the test of time. This model is incredibly durable, with users report being able to use it all day without the saw flagging or slowing down. You may be thinking, “Okay, but for all day use with one of these, you would definitely burn through several batteries,” but you would be wrong! This saw's battery can stand up to just as much work as the saw itself, and you will be surprised at how far the battery can go between charges. The saw also has great balance, even with you add in the included extension, so you will always feel safe when operating this saw, even if you do not have much saw experience. 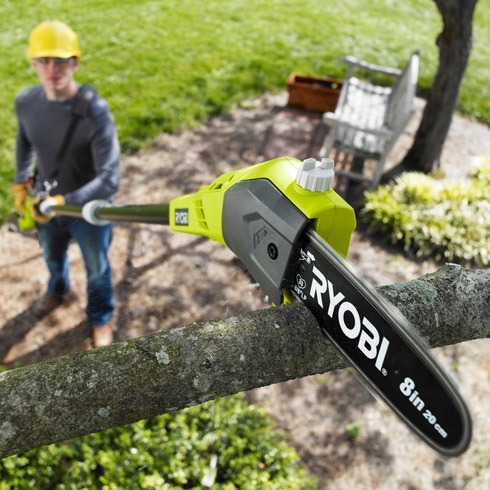 If you want a good saw that will hang with you all day, you will have found it in the Ryobi One+ Cordless Electric Pole Saw. The Ryobi One+ is an awesome little saw that will last all day and then some for the tougher jobs. It does make more ragged cuts, so it may not be the ideal choice for pruning growth that you would like to grow back in the future. The Oregon Cordless PS250-E6 Pole Saw Kit is a great pole saw that will chomp through anything you place in front of it. Users report being so impressed with this little guy that they compare it to a Star Wars lightsaber! 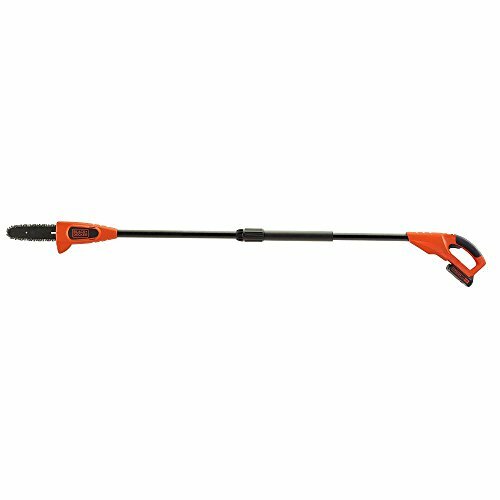 Some users who were using gas powered pole saws in the past say they did not notice any sort of difference in power output with this cordless saw. You really cannot find a more efficient choice than this one – it can chomp through limbs up to eight inches in thickness, as well as take out small trees and hedges at their base for clear cutting purposes. The battery will probably last longer than you can, so no need to worry about having to sit down and wait for the battery to recharge. If you are looking for an energy efficient saw that can stand up to whatever job you throw at it, you will have found it in the Oregon Cordless PS250-E6 Pole Saw Kit. The Oregon Cordless PS250-E6 Pole Saw Kit is a fantastic pick that will be able to handle pretty much anything you would ever need it to. It is efficient, powerful, and saves energy with its long lasting battery. Some components on this saw are made of plastic, but it certainly does not impact the saw’s effectiveness. The Greenworks PRO is probably the most convenient option to use on this entire list! It has a number of features that aid in use and cut down on overall time you will need to spend working in your yard, and increase the time you can actually spend enjoying your yard. It has an included hook that helps to snag branches that get caught in the trees after you have cut them free. Its battery charger automatically stops charging the battery when it has hit its full charge, so you do not need to worry about constantly checking in to make sure the battery is not being overcharged and suffering damage. This model comes with a shoulder strap for easier carrying. It starts and stops on a dime, so not only is it easy to use, it is also very safe to use. It makes fast, efficient cuts, and before you know it, your yard work will be completely finished! The Greenworks PRO is a great pole saw that will make your life about a thousand times easier with all of its convenience features. The only thing that is not convenient about using this saw is that the included instructions are difficult to understand. What is a Cordless Pole Saw Best Used For? Cordless pole saws are best used for trimming trees when you know you are going to need to make cuts at awkward angles, angles that could be compromised by a saw powered by cords or weighed down by a heavy gas motor. These saws are also great for making cuts on trees far away from any power outlet and in a location where it would be inconvenient to haul along a generator or a gas tank. The best made models will not require a lot of time, energy, or money to be spent on upkeep, because they simply will not break down. Trust us – it is better to spend more money up front than to be constantly shelling out dollars to maintain a cheaply made cordless pole saw. The biggest concern most people have when buying a cordless pole saw is if it will have as much power as its corded and gasoline counterparts. The answer is yes, if you invest in a nice model. Cheaply made models will likely be significantly weaker. These often require some assembly, and you need to become adept at changing out the batteries because they will need to be charged often. You want a nicely made saw for which all of those processes are intuitive over a cheaper saw that you will have to wrestle with every time you want to charge the battery. Cordless pole saws are a really a game changer when it comes to convenient tree trimming and clear cutting. Make sure you are taking all of the factors discussed above into account, and you will be able to find an option that will revolutionize your yard work experience forever.